Video conferencing has become a mainstream, must-have application for every business. 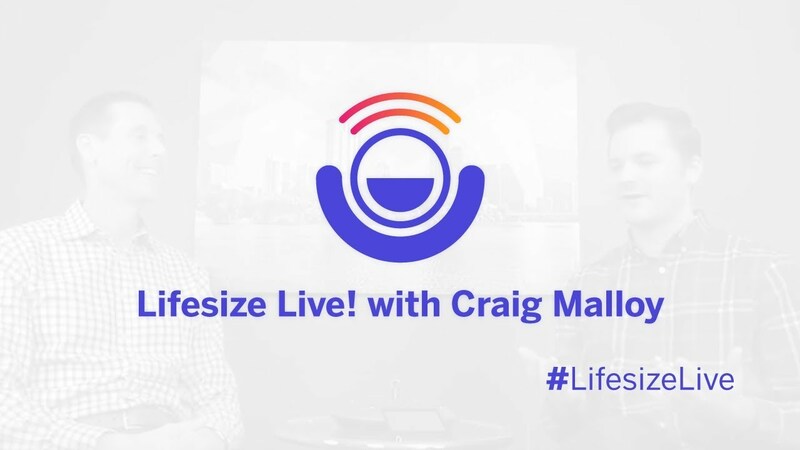 Hear from Lifesize Founder and CEO Craig Malloy about his 22-year journey to this point and what he’s picked up along the way. Hello everyone, and welcome to Lifesize Live! The live web show produced entirely through the Lifesize platform. I'm your host, Julian Fields, and with me today is the founder and CEO of Lifesize, Craig Malloy. All right, so we have 10 minutes, effectively, to talk through 23 years of video conferencing history. Let's set the scene — we're in 1994, Friends is on TV, and meanwhile, you're doing something kind of cool. Yeah, it's interesting. When Julian asked me to talk about 23 years of video communication history in 10 minutes, I thought that was an interesting challenge… So I'm kind of breaking it up into the various disruptions in the industry — key time frames and key innovations that helped the progression to get video conferencing where it is today. Back in 1994, my first job in video communication was as a product manager at a company here in Austin, called VTEL. And looking back on it, it was a really interesting time because the company was small and the video communication market was still in the early adopter phase. There were three public companies — PictureTel, CLI and VTEL — all chasing this very early video communication market. So at this point are we talking about the kind of video conferencing we saw on cartoons, like The Jetsons? Yeah, no. It was actually way worse than that. The Jetsons was actually good. We're talking about video that was 1/10th the resolution of broadcast TV at the time. It was just terrible, with very low frame rates, and the systems cost $50,000. And surprisingly, people were actually buying them. It just shows you how valuable the technology is by how much people are willing to pay for it. So I was product manager at VTEL for a couple of years… Oh, a funny story — the user interface on those systems was literally a C-prompt — you know, the “C:\_”. You’d literally have to write code back then to make a video conference call. I realized there wasn't going to be a big uptake in user adoption from that interface, but I could see the technology advancement that was going to come along and wanted to be a part of it. So a couple of coworkers and I left VTEL and started a company called ViaVideo. So, we started that company in 1996… And a little funny story for that — this time for the graphical user interface, we modeled it after Nintendo 64. I had given my son a Nintendo 64 for Christmas that year, and we were looking for a model for our GUI for this system. That’s actually how we modeled the UX. So that ushered in the era of the low-cost, set-top box. The quality wasn't really much better; they were just less expensive and easier to install and use. And so that ushered in a huge growth in the business. And about that time, right when we were launching that product, ViaVideo was purchased by Polycom. They put that product into the Polycom distribution channel for their speaker phones, and that was a big success. I ran the video business at Polycom for a few years, and we brought in thousands of new video conferencing customers into the market. And with the growth came some new competitors — which always happens in technology markets. And so that particular phase from about 1999 to 2003 is where the very early indications of high-definition video conferencing started to come about. My co-founder from ViaVideo and I thought, "Wow, you know, maybe we can make a video communication system in HD. That would be cool.” We thought people might actually use it if the quality was good enough. And so we left Polycom and started Lifesize shortly thereafter in 2003. The next disruptive phase in the video conferencing industry was high-definition video communication over the open internet. Previously, we were using these things called ISDN lines, which most people will have never even heard of. They’re pretty much extinct these days. But with the advent of high bandwidth IP networks within companies and the internet backbone getting a lot better, the technology was finally catching up to the innovation. At that time, the quality was so good that we were actually better than the broadcast TV that you could get in your home, and we were leading the HD content industry. And so the company grew very, very quickly and brought in a whole new group of customers. And then that company, Lifesize 1.0, was purchased by Logitech in 2009 — which was a nice outcome. I left the video conferencing industry for a few years after that. I didn’t want to be part of a big company. I was more of an entrepreneur. But then a really interesting thing happened again. The next technology transformation came along. And that technology transformation was the cloud service delivery of real-time communications. Salesforce kind of started the whole “no hardware, everything runs in the cloud” idea, and that worked great because if there was a little delay in your CRM, that was fine. But by the time the technology got good enough to handle real-time voice and real-time video — well, you could see what was going to happen. The on-premise infrastructure was going to die. It was like if you were still making flip phones when the iPhone was coming out. Cloud delivery of real-time, high-definition video conferencing was a very complex problem, but you know, it also had the potential to solve so many problems for businesses. So I came back to work as the CEO of Lifesize. It was a painful couple of years completely reinventing the business. Reinventing the technology. Reinventing the go-to-market. Really just reinventing the company. And in the end, we bought ourselves out of Logitech, and it’s been fun being independent again. And now you look at where we are today with a cloud service delivery model with connected devices. An internet of things company with desktop and mobile apps that provides effortless scale and deployability for customers. It’s been 23 years, but video conferencing is finally in the mainstream. Looking back through all the years, I always thought, “It’s going to be next year.” But it wasn’t going to happen with C-prompt. It wasn’t going to happen with ViaVideo or Lifesize 1.0. But it turns out, ironically, that it’s been home use, personal use of video communications that really drove it mainstream. Things like, you know, Skype, and FaceTime. People use these technologies so much in their personal lives that when those same people walk through the doors of their offices, they expect it. And they expect it to just work. So that's kind of where we are today — a consumer-based user experience but built on the enterprise-class scale, security and reliability of business video communications. You know, I see our customers who adopt our solution fully — for every person and every conference room — it transforms their business. It provides better employee engagement and more personal relationships. It's really fun to see, and we’re really excited about the future.